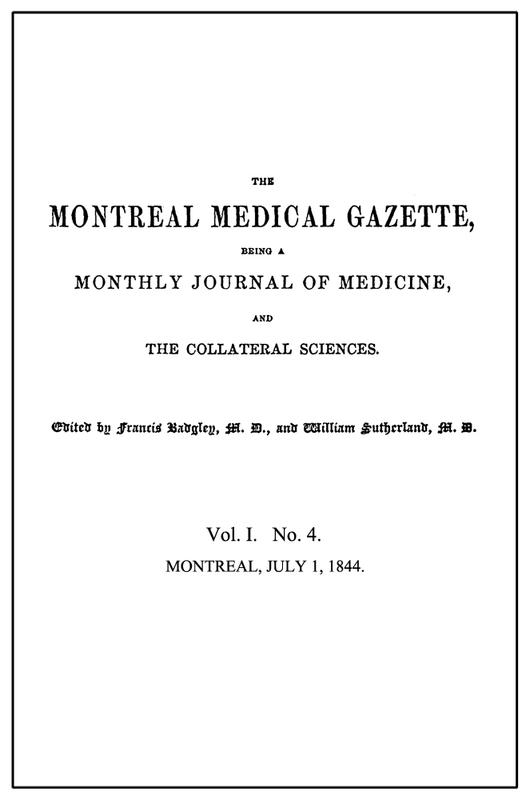 In 1844 Badgley and his colleague William Sutherland started the first medical journal in Montreal published in English, the Montreal Medical Gazette. It was replaced on 1 April 1845 by the British American Journal of Medical and Physical Science. This second periodical was begun and edited by Drs Archibald Hall and Robert Lea MacDonnell*; Dr Badgley was one of its regular contributors. He loved controversies and contributed his share to those current in hospital and university circles. In his editorials he campaigned against those in charge of McGill University and the Montreal General Hospital, and against the Montreal Board of Medical Examiners, since in his opinion they all gave proof of chauvinism and discrimination. As secretary of the Montreal Medico-Chirurgical Society (founded in 1843) from 23 Sept. 1843 to 1 Feb. 1845, Dr Badgley recommended that an association comprising all the doctors in the united Province of Canada be formed to bring together the existing medical societies of Montreal, Quebec, the Eastern Townships, and Toronto. This plan was put forward again by Badgley in 1849, but it was not realized until 1867, when the Canadian Medical Association was founded at Quebec. Dr Badgley also took an active part in setting up the College of Physicians and Surgeons of Lower Canada, and in securing official recognition for it by the legislature in 1847. The bill was not passed without argument. Drs Badgley and Joseph Emery-Coderre worked with the members of the Frontier Medical Society of Clarenceville, Canada East, to ensure that future governors of the college would be elected on a basis of representation in proportion to the number of doctors in each region, and not be nominated by the medical societies. They maintained, with reason, that doctors in the towns, who did not know what a rural practice was like, were ill equipped to establish a law and regulations to conform with the aspirations, rights, and privileges of non-university doctors and country practitioners. Badgley and Emery-Coderre succeeded in getting the bill amended before it became law. Epub 20140926.epub If you cannot open a .mobi file on your mobile device, please use .epub with an appropriate eReader. Mobi/Kindle 20140926.mobi Not all Kindles or Kindle apps open all .mobi files.